The present world largely revolves around google and google revolves around Contents/Blogs. No matter how much you involve yourself in paid marketings and campaigns, there is always going to be someone with the right content analysis/research and insights who is going to be one step ahead of you without investing a single penny. How to become a smart content marketer? News Diet gives you the trending news topics around the world at that particular day which gives you an idea about the content that you should focus on. You can use our pre-analysed data for your related topics and articles. We know that your time is precious so our News Diet algorithm keeps track of the topics and the right influencers for that topic. By identifying the right influencer, you can reach out to them to influence your content or campaign to the right audience. News Diet algorithm analyses each and every article to determine the reason behind its success such as word count, advisable topic length and competitors website analysis, etc. So News Diet makes sure you’re always one step closer to generating more leads. Thank you for listening to me! Bye! On an average a user reads about three to ten articles per day which amounts to 15 to 50 minutes per day. For a month it’s about 450–1500 minutes. Social Media and News Applications focus only on the recent articles and not on historic ones. This makes the user spent time on quadrant 1, quadrant 3 and quadrant 4 and not on quadrant 2. But according to time management principles focusing on quadrant 2 is important and less emphasized by many. By using www.condense.press the reader can consider picking about 20 to 50 popular articles per month. This takes around 100–250 minutes per month. With this lesser time spent, most of the important articles have been covered. 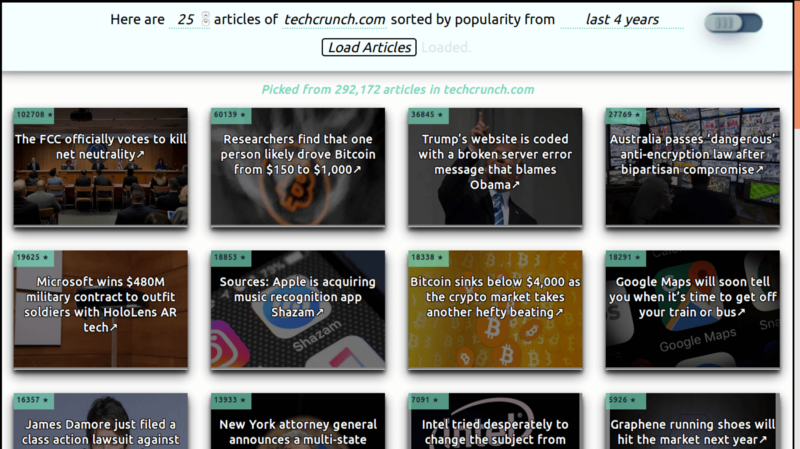 It takes about 4.5 to 6 times lesser time to read just the popular articles. We live in a knowledge worker age. We attain information from books, news, internet, people, life experience, and everything else. Books are highly condensed but outdated. News articles are fresh but not condensed. So there is a gap between books and news. The current recommendation systems used by news websites like BBC or apps like InShorts or Google Assistant News are not user customizable particularly with respect to time. For example the user cannot pick the most popular articles as per the time specified like say last year. So I made a webapp which is live at https://www.condense.press/ It shows the popularity of the articles, the dates written, the number of words and the category of the articles through charts and other means which will help the user in picking the right article to read. Also personalisation and analytics used by Facebook and Google News is not user customizable. For example, in Facebook a user might not click the Like button of a post for privacy reasons but might actually be interested in it. In such cases the user is not given the control to tweak the algorithm. Another example is that search engines balance relevance of the search term and popularity in their results. I aim to provide control to the user on what should be prioritized more.